was born through a partnership with the City of Kingston and the Kingston City Schools. The KHS art department was asked to create an after school program that engaged students in Kingston, through the Arts. With Kingston coming into it's own as a vibrant Arts center, but Midtown, Kingston struggling to fill its empty storefronts, we made it our mission to transform those empty storefronts into opportunities for artists, students and the community. The community has been supportive and this experiment has provided many opportunities for our students to engage, learning skills in arts management, the power of community arts collaborations, and most recently we have been able to offer hands on art making opportunities, as our alumni artists have stepped up to offer workshops and series to the public. Katherine Solomon is a photographer from Rosendale, now living in New York City. She graduated from Kingston High School in 2010, and attended Skidmore College. Since graduating, Katherine has worked as a photo assistant, worked in the photo department in a furniture warehouse, and worked in a gallery. She is currently assisting photographer, Mark Seliger. In her own work, she has photographed for a few magazines, including Teen Vogue and Nylon. She loves photographing animals and domesticity. In my work I tend to focus on the same themes over and over. I am obsessed with ideas of domesticity and the troubled housewife. I have tried and tried to broaden my interests, but I keep returning to photographing housewife scenes over and over again. I think my pictures tend towards having a darker undertone. Photographs that are most interesting to me are pictures that have an obvious story to tell (with lots to look at), but you are left to come up with the story yourself. 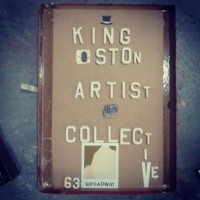 Vincent Pidone: At the Kingston Artist Collective in collaboration with The Pop-Up Gallery Group (PUGG). The Opening Reception will be held from 5-7pm, July 7th, 2018. The KAC is a community space and cafe and it is modeled after DIY Art Spaces ,focused on creating safe and supportive centers for community organizing, conversation, recess, education, films, and performances. Led by professional teaching artists, Kingston, high school, Senior Seminar students attended four day-long workshops in WSW’s papermaking, screen-printing, and intaglio studios. This year’s session asked students to define the word research and consider how it applies to the artist’s career. P.U.G.G. began their work with a show featuring Scott and Amy Ackerman. Scott graduated KHS in 2000 followed by his sister in 2003. they both remain active in the local arts scene, producing richly narrative emotional work. P.U.G.G. featured Susan Spencer Crowe, Carol Struve and Stephen Niccolls, at 591 Broadway. Ed Kang, the owner of 624 Broadway offered an empty storefront to P.U.G.G.. The group spent November renovating the space, preparing for their first show in their new gallery. The first Saturday in December P.U.G.G. hosted its first show in their Gallery at 624 Broadway. Clay work by Kelli Sellik and Prints by Frank Pesko. It was a great success an opportunity for the group to share their skills at installation and opening events. Thanks to all of the community that helped renovate and attended. The Pop Up Gallery Group collaborated with Kingston High School Chemistry for Artist and Drawing and Painting students, to create the “Work Of Art”, a 20’ cyanotype mural exploring the depth of creative work that goes on everyday in midtown, Kingston. The final exposure, took place during Community Day, at the Broadway Commons, 2017. P.U.G.G. hosted the KHS Media Arts Awards, May 7th, 2017. Students received their awards at the yearly media arts conference, hosted in Westchester, earlier in the year. Students showed digital and silver photography. Adrielle Farr is an Alumni of Kingston High School’s Class of 2009. She received her BFA in Fine Arts from The School of the Museum of Fine Arts. Adrielle’s work is concentrated in Illustration and Animation. “Life of Moa” is a collection of murals depicting the fantastical prophet, Moa. This body of work explores the concept of artist as historian, and plays with traditional mythological narratives from varied cultures. P.U.G.G. hosted the 9th annual, KHS Senior Seminar Thesis Show and opening, June 3rd, from 4-7pm. Each student worked independently, developing a body of work that explored a personal interest with in the visual arts. 13 students exhibited. illustration, printmaking, painting, mixed media, photography and drawing. The ideas represented were as diverse as the students. "Yard Sale" was a curated collection of charged objects, intriguing artifacts, crafted works, clues, sentimental treasures, etc etc. The room was a portrait and the pieces spoke to a nostalgic, quirky and intimate aesthetic sensibility. Items included a worn ‘ET’ VHS, soap skull, a polaroid titled, ‘Old Friends Bus Trip SF’, drawings, letters, zines and more!… Each with a backstory or sentimental connection. Orange price stickers adorn the belongings, blurring the line between intimacy and consumer culture. Wayne’s awards and honors include the Awagami Artist-in-Residence Program at Awagami Paper Factory in Tokushima, Japan; NYFA MARK ’09; Two Full Fellowship Awards for residencies at the Vermont Studio Center, Johnson, VT; Two Residencies at the Frans Masereel Zentrum voor Grafiek, Kasterlee, Belgium; John Michael Kohler Foundation Arts/Industry Artist-in-Residence, Sheboygan, WI; Women’s Studio Workshop Artists’ Fellowship; and an Artists At Work: New York State Council on the Arts. CHRISTIAN GALLO, "LOUIS SHOTWELLS' DAY OFF" NOV 4 - 28 @ P.U.G.G. Consisting of photographs depicting images of abandoned places and lifelong friends, Gallo takes his influence from the pen name he created, Louis, who represents his creative energy. Louis Shotwell’s Day Off is a play on Gallo’s “Ferris Bueller” like behavior throughout his time attending Kingston High School. The exhibition serves as a memorandum of Gallo’s experiences and a retrospective of his life so far. Gallo graduated KHS in 2008 and attended Queens College to study photography.